The last great undiscovered country is vast, wild, and weirder than you can possibly imagine. And it's nearby, waiting, accessible by the press of a button, or a simple gesture, or even just a thought. The Matrix holds a whole lot more than selfies and cat videos - it has artificial intelligences, electronic ghosts of people formerly alive (or perhaps still living), and deep wells of pure data that can swallow you whole. Oh, and a copy of every secret ever recorded electronically. The possible rewards of exploration are great, and the dangers are greater. Data Trails is the Matrix sourcebook for Shadowrun, Fifth Edition. offering more options for decker and technomancer characters, including qualities, programs, gear and more. With detailed examinations of hacker culture, information on diving deep into immersive hosts, and briefings on the strange sites hidden in dark corners of the Matrix, Data Trails is a vital resource for any Shadowrunner players involved in the omnipresent flow of information. Non-Matrix specialists have chances to get in on the adventure as well, with game details explaining how their skills and expertise translate into the wild virtual world. 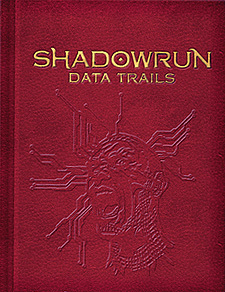 Data Trails is for use with Shadowrun, Fifth Edition.